Guys, this one is for YOU! Jennifer of Passion for Parties threw a festive BREW BASH birthday party for her husband that will have all your guys asking for a beer party! 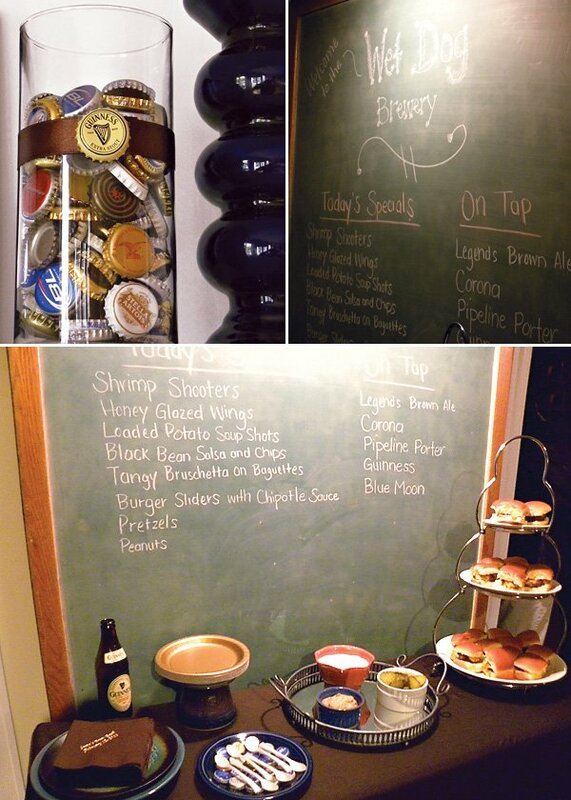 Decorations included beer cap “baubles”, chalk board menus, and decorative beer signs. 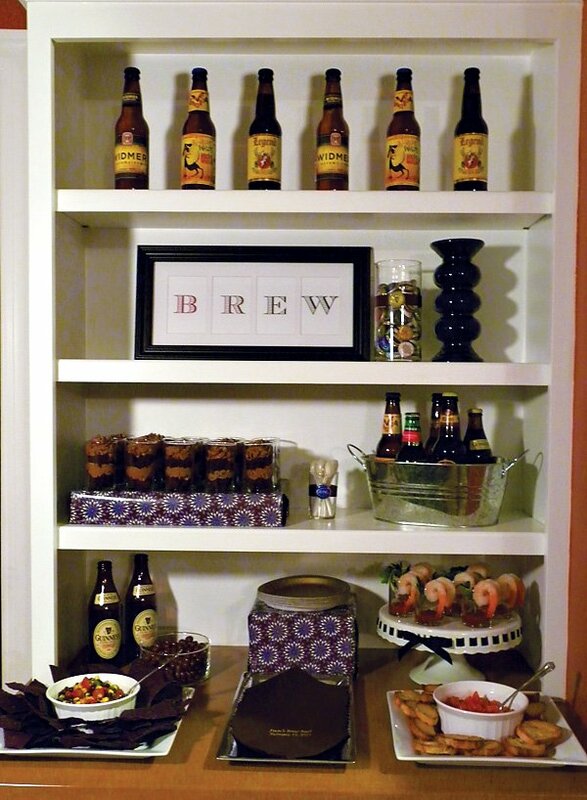 So when you are on the hunt for a party idea for your man, turn your house into a pub-worthy brew bash! What I love most about this Brew Bash party is the tasty pub appetizers that Jennifer included – such as sliders, baked potato soup, honey glazed chicken wings, chocolate cake shots, and of course – LOTS of beer for tasting! Coming up with party ideas for guys isn’t always easy. 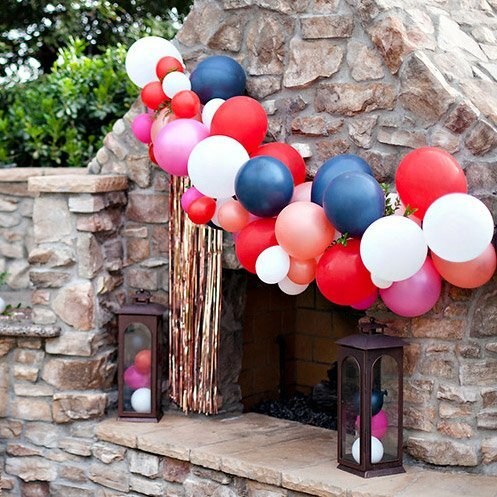 Adorable themes with cute party buntings to match just don’t seem to cut it for them. 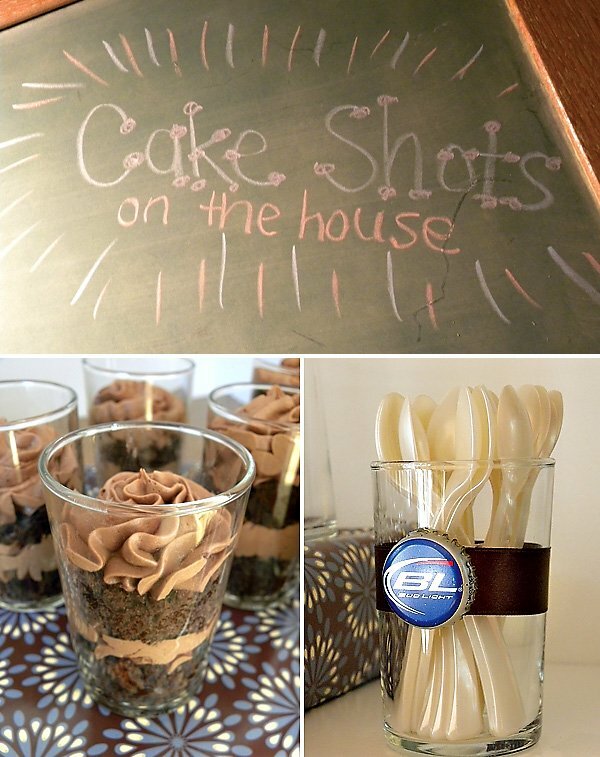 So when it came time to plan my hubby’s birthday party this year, I knew two things. First, I wanted it to be special, and second, I wanted to ROCK IT! I drew inspiration from his love of beer and hanging with his buddies and created a party theme that I just knew he would love…a Brew Bash! 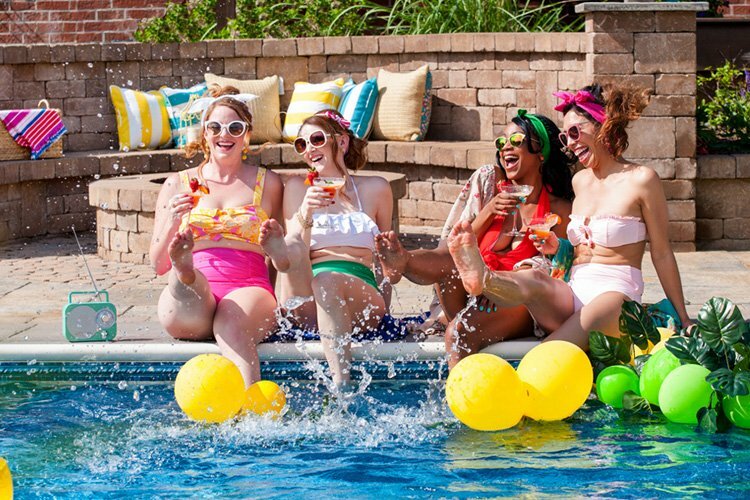 Styling this party was such fun! We started by completely emptying out our living room. Furniture, tables and rugs, gone. Shelves, emptied. We rented bar tables and stools from a local rental center and set them up in the space. The tables were covered with black linens, topped with empty beer cartons and adorned with peanuts for a true pub feel. 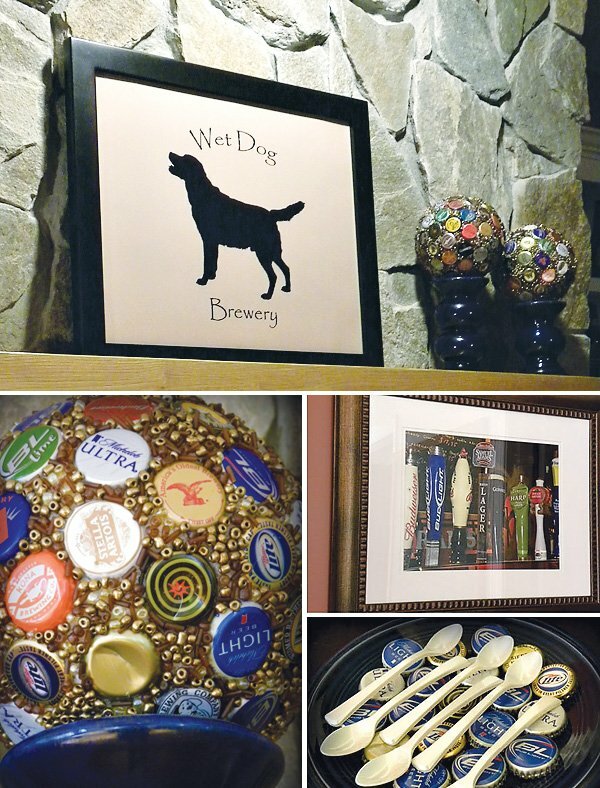 Bottles of imported beer, bottle caps and beer-themed photographs took center stage in the decorating process. On a recent trip to NYC, I snapped lots of pics of beer taps, pub signs and such. I had the photos blown up and framed for the party. I created the word BREW in Photoshop and framed each individual letter in a four-photo frame, as well as created a custom brewery poster for the mantle. I adhered bottle caps to styrofoam balls and glued beads all around the caps to create bottle cap “baubles.” These were also showcased on the mantle and were a huge topic of conversation. An enormous chalkboard showcased the pub menu and a few of the beers that were “on tap” (meaning “on hand”). Guests were blown away by our living room transformation! Pub food was a must for this party! 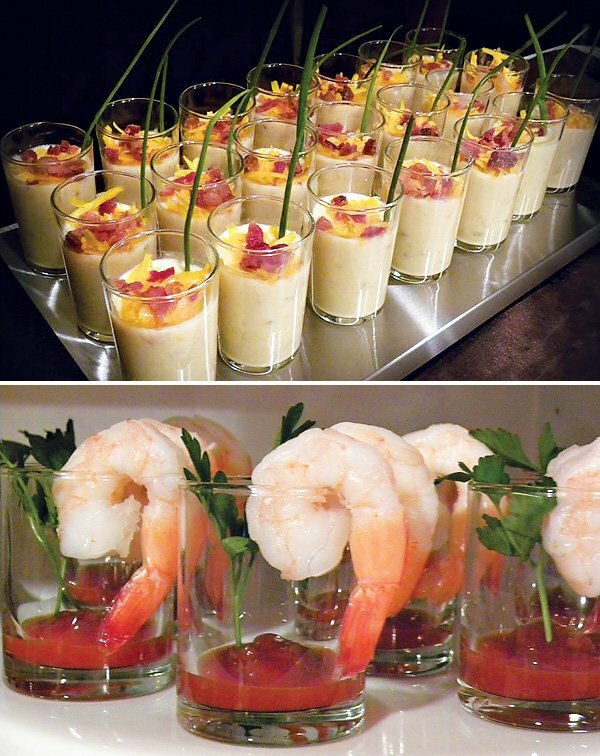 We stayed true to theme by serving the majority of the food in shot glasses. Loaded baked potato soup, shrimp cocktail, honey glazed chicken wings, cheeseburger sliders, bruschetta, black bean salsa, pretzels and peanuts were all on the menu. Birthday cake was also served in shot glasses and “cake shots” were on the house! 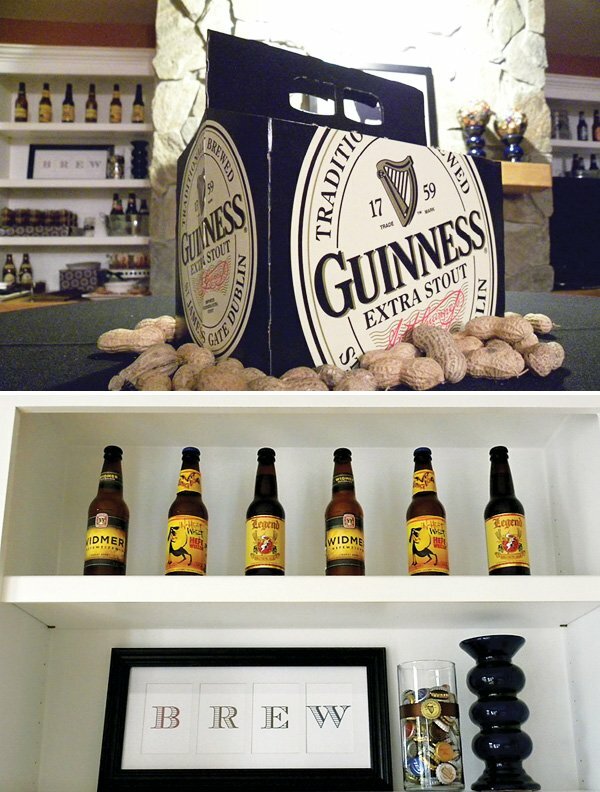 In lieu of gifts, guests were asked to bring a six-pack of their favorite brew. Everyone had a blast taste-testing the different beers and it helped keep cost down to a minimum. 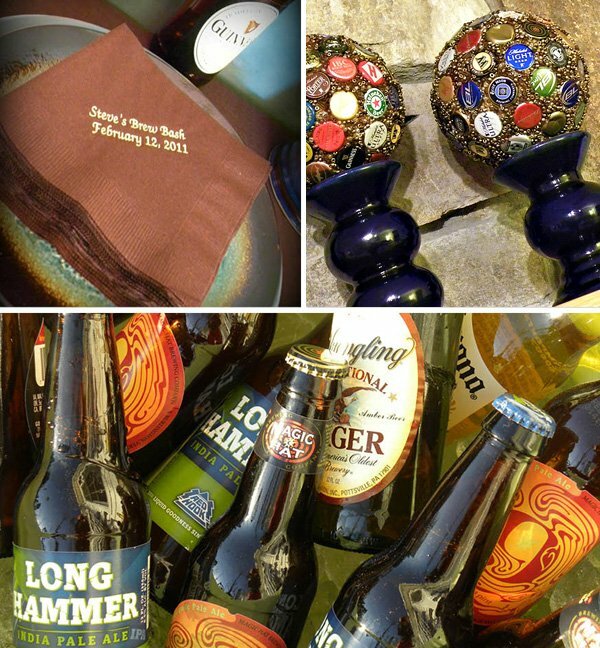 “Steve’s Brew Bash” was custom printed on the napkins by PlatesAndNapkins.com. You certainly succeeded with something special and ROCKING IT! Fabulous – well done. Rocked this party!! I love it! LOVE, love, love this!!! This party is every man’s dream. GREAT job Jennifer!!!! 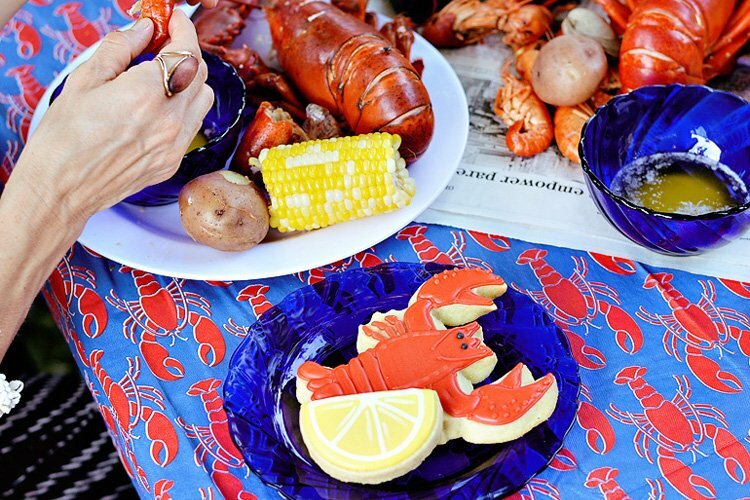 Not so much down with beer, but man I could get on “Team Food” for this party… tata soup, shrimp, cake shots Oh my! Love how you used the bottle caps on the centerpieces. Awesome. great job! Love all the details! What a way to make your man feel special! excellent ideas – I've gotten some great ideas for my hubby – Thank you. 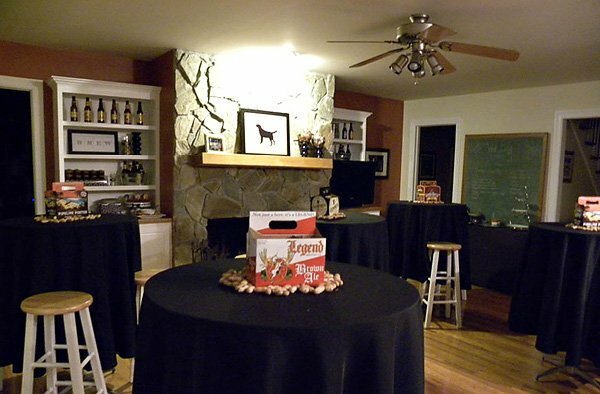 I am planning on having a beer tasting themed party for my boyfriend’s 40th… Thanks for the decorating ideas! What type of adhesive did you use on the baubles? 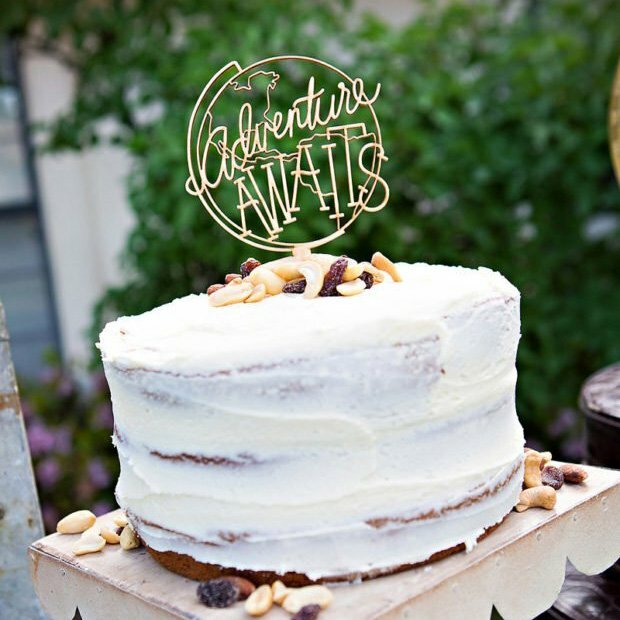 i am planning a 30th for my husband and love this idea! about how many beer caps did you use for the balls? and did you buy them somewhere or just collect them over time? I’d love to know the type of glue you used for the beer cap balls as well. Thanks!